LOS ANGELES - Melissa Garcia was just three years old when she crossed the US border from Mexico in her mother's arms. She remembers almost nothing of the perilous crossing that turned her into an undocumented migrant in a country that she now calls home. She is one of thousands of so-called "Dreamers" set to be plunged into legal limbo with the phasing out of the Deferred Action of Childhood Arrivals, or DACA, a program which allowed them to live and work legally in the United States -- but which can only be renewed for the last time on Thursday. "Under DACA I can go out in the street without worrying that I'll be deported," said Melissa, who is 23 and works in a shop. Her mother Leticia crossed the border with Melissa and her five-year-old brother, traversing the border fence and the desert of Sonora before trying to build a new life for her family in the United States. "They didn't find out that they didn't have any papers until they were grown up," said their mother, who is now 43. "I wanted them to have a normal childhood. I wanted the best for them." The administration of President Donald Trump said on September 5 that it was winding down DACA in six months, and Thursday is the last chance that the Obama-era scheme's beneficiaries have to submit renewal applications if their permits expire before next March. 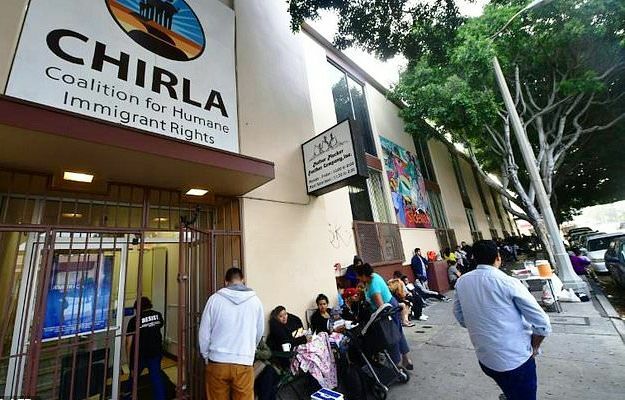 "By March 5th they want to have already processed all of those applications," said Luis Perez, director of legal services at the Coalition for Humane Immigrant Rights in Los Angeles (CHIRLA), which offers free advice to dreamers. Around 150,000 permits that are due to expire between September 5 and March 5 are to be processed for renewal. If a permit expires on March 6, there is nothing that can be done. Many other immigrant organizations have also scrambled to defend the Dreamers. With CHIRLA's help, Melissa spent the past week wading through the paperwork for a renewal application. When she arrived at dawn at the center, accompanied by her mother and with her pet chihuahua in a bag, she found 20-year-old university student Bryan Soils already waiting. Thanks to DACA, he obtained credit to pay for his college and found legal employment. He, too, crossed the desert with his mother when he was just seven years old. On his forehead he still bears a small scar from when barbed wire cut him as they crossed the fence. The Dreamers brought deck chairs, blankets and coffee for their wait in line outside the legal aid center. Despite having no papers, they all feel American. "I've been able to go ahead and find a good career path, a good job here in the United States, the only country I kind of know as home," said Pablo Gomez, a mortgage consultant at Wells Fargo bank. "Removing it, as the Trump administration is trying to do, would probably take that all away from me, and force me to go back to a country I don't know," he said. The decision by the Trump administration has forced Congress to reopen the immigration debate, which already broke down in 2001, 2006 and 2013. "It's actually really scary, because I'm afraid of losing everything I've accomplished so far. I'm hoping and praying to God that things get resolved quickly," said Jesus Cervantes, a sales rep at a tire distribution company. "I'm hoping for the Dream Act. I'm hoping that Congress will pass the Dream Act, so that people like me and everybody at the back of the line can have a taste of the American dream," said Abby Garduque, tearing up. A resounding "no" is the usual and swift response when the possibility is raised of the Dreamers returning to the countries of their birth. Leticia's son married an American citizen and now enjoys legal status. She now hopes that Melissa's precarious position can be legalized too and she can finally enjoy some peace of mind. "That way, even if I have to leave, I'll leave happy," she said. Melissa Garcia was just three years old when she crossed the US border from Mexico in her mother's arms. She remembers almost nothing of the perilous crossing that turned her into an undocumented migrant in a country that she now calls home.